We decided to explore these two well-known traditional carols to see if we could create a brand new contemporary arrangement suitable for Rock Choir but also with a pop lead-vocal! So we set up a studio improvisation session with our Grammy and Emmy award winning producer, Kipper and the famous jazz/funk pianist, Jason Rebello, both of whom met one another when working with Sting. The 3 of us had a very creative Christmassy time building the song and once the instrumental was recorded I set about creating the various new vocal harmonies and then improvised a lead pop vocal line to help create the contemporary feel I wanted for it. Both The First Noel and Silent Night follow a 3-beat pattern so we knew these two carols inevitably would fit but we just needed to ensure all the harmonies could come together and work! It’s a magical end result and for us epitomises the traditional warm nostalgic Christmas that many of us yearn for. · According to the result of the recent BBC TV 'Trust Me I'm a Doctor’s ‘Trust Me First’ ground breaking experiment, broadcast at the end of September, Rock Choir Members from Derby experienced a 40% up-lift in their ‘’ natural high’’ endocannabinoid levels by taking part in a Rock Choir session compared to only 20% when cycling and dancing in the same controlled experiment. · Thousands of people claim an increase in happiness and joy by taking part in Caroline Redman Lusher's Rock Choir each week and report an improvement to their health, well-being and happiness. 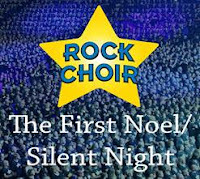 · Caroline Redman Lusher's Rock Choir was the first contemporary amateur choir to offer an inclusive and accessible singing life-style to the general public. Led by an expert musical team, award-winning Rock Choir promises to support the great British public by improving well-being, mental-health and happiness across the country. Recently featured on BBC's 'Trust Me I'm a Doctor' Music Special, Rock Choir Members were invited to take part in a ground-breaking experiment to monitor the release of chemicals found in the brain that create our natural-high. These Endocannibanoids, also found in Cannabis, were thought to be released by the brain under certain conditions resulting in a surge of happiness and well-being. Rock Choir Members were monitored in scientific conditions such as cycling, dancing and taking part in a Rock Choir group-singing session. An increase of 20% was recorded after the group had been cycling and dancing but a massive 40% after they took part in the Rock Choir session. This ground-breaking result could have a profound impact on the way mental-health is treated in the future and Rock Choir Founder and award-winning singer, Caroline Redman Lusher, is keen to reinforce these scientific results. 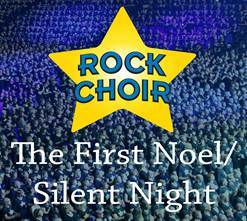 "Rock Choir supports nearly 30,000 of the general-singing-public who take part in weekly rehearsals across the UK each week. Most of them cannot read music and don't consider themselves as having a strong voice but they love pop music and love singing, often in the car or in the shower!! By taking part, they meet new friends, engage with music and take part in an exciting new social life. Rock Choir is a unique formula of music, education, and life-style. Every element of the Member's experience is meticulously planned to ensure that the on-going reaction of each member results in happiness, joy, confidence and a new lease of life. Based on Member's feedback that is received daily,, the Rock Choir experience manages to improve a vast array of issues that sadly affect many of us in today's society including loneliness, stress, divorce, illness and empty-nest syndrome. Members report coming off anti-depressants, finding their love of life again, an increase in confidence, they become healthier and fitter, experience better relationships at home and at work. The list is endless. Rock Choir has been around since 2005 and it now has a team of over 130 dedicated and talented individuals who are all trained in how to deliver the unique Rock Choir formula to each of the 400 communities. There is now scientific proof that taking part in Rock Choir gives its Members a natural-high uplift of 40%! A result which could help shape the future of combating challenges faced with mental-health. Who doesn't want to be well and who doesn’t want to be happy?!"